September 2018 Highbanks Employee of the Month! This month we have a nomination from a family member for Latoya Morrisette, a nurse with us here at Highbanks Care Center! Latoya has been with Highbanks since May of this year and has shown great growth as a nurse and has become a strong pillar of the exceptional care we provide. 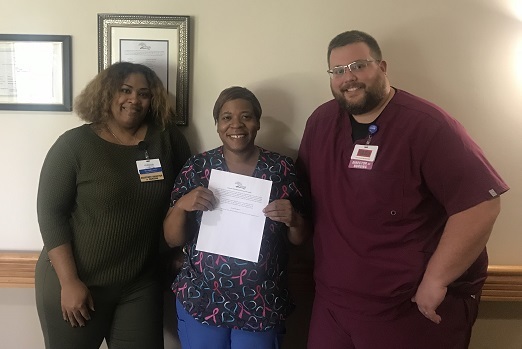 Latoya has proven her adaptability and leadership while with us and we are happy to have her on board with us here at Highbanks Care Center! Congratulations on earning this much-deserved recognition and thank you for your dedication to our residents and company!